Three companies are voluntarily pulling jerky treats from the shelves after the Food and Drug Administration warned of tainted jerky treats coming mainly out of China. 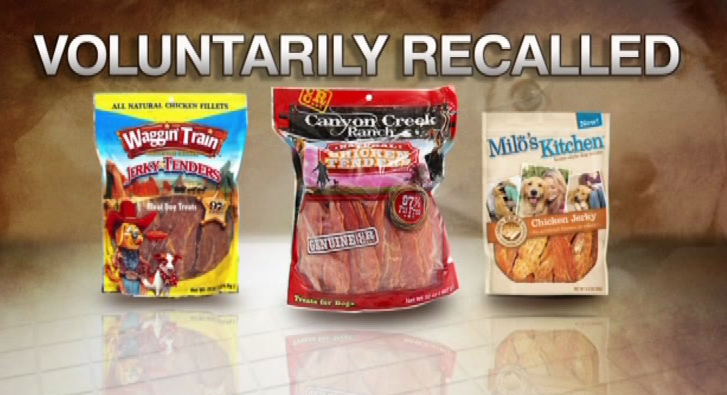 Nestle Purina, Canyon’s Creek and Milo’s Kitchen have all issued voluntary recalls of their chicken jerky products, seen below. Check your pantry for these treats and any others made in China. The treats are packaged as chicken tenders or strips made with chicken, duck, sweet potato or dried fruit, or any combination thereof. The vast majority of pets sickened and killed have eaten chicken jerky treats made in China. Nearly 600 dogs and cats have died and roughly 3600 have been sickened since 2007, and the FDA still does not know why the treats are making animals sick. Salmonella, antibiotics, metals and pesticides have all been ruled out. The best way to keep your pet safe is to eliminate jerky treats from his diet. If you think your pet has eaten tainted treats, see your vet immediately. The FDA released fact sheet with other tips to keep your pets safe. Hundreds of dogs have died and thousands more have been sickened after eating jerky treats made in China. Now the Food and Drug Administration is issuing an alert warning dog owners about the potential hazard of these jerky treats, which are packaged as jerky tenders or strips made with chicken, duck, sweet potato, or dried fruit, or any combination thereof. Pet owners and vets have reported illnesses and deaths to the FDA since 2007, with roughly 580 deaths from approximately 3600 illnesses, including cats. The FDA has conducted more than 1200 tests for things like Salmonella, metals, pesticides and antibiotics, but still does not know exactly what about the jerky treats is making pets sick. “This is one of the most elusive and mysterious outbreaks we’ve encountered,” Bernadette Dunham, director of the FDA’a Center for Veterinary Medicine, said in a statement. Symptoms include vomitting, diarrhea, decreased appetite, decreased activity, and increased water intake. About 60 percent of the cases involved gastrointestinal illness and 30 pecent involved kidney and urinary systems. The symptoms can appear within hours of eating the treats. If you think your dog has eaten tainted treats, be sure to see your vet immediately. The FDA notes that although 580 dogs have died, many more have recovered. The easiest way to keep your dog safe is to eliminate jerky treats from their diet. You can also check the packaging to make sure the treats were not made in China, where most of the tainted jerky treats have come from. The FDA has compiled a fact sheet for dog owners with additional tips on how to keep your dog safe.